My first experience growing tomatillos didn’t work out so well. I bought a beautiful healthy 10” tall start from Home Depot, brought it home and planted it, and it grew, and grew, and grew, and then it grew some more. By the end of the summer, it was a sprawling, 4’ high by 5’ across plant with a 2” thick woody stem, and not a single tomatillo in sight. The poor thing was lonely. No one told me this odd fact: tomatillos cannot self-pollinate. 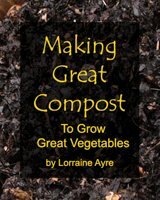 You must grow two or more plants in order for them to produce fruits. The tomatillo is in the “solanacea” family, which makes it related to tomatoes, eggplants, peppers and potatoes. The fruit looks a bit like a small tomato, except it grows inside a husk that makes it look like a little Chinese lantern. From these two species, differetn cultivars have been developed, in green, yellow and purple colors. Traditional green salsa is made with slightly unripe tomatillos and has a deliciously tart, slightly acidic bite. Ripe yellow or purple tomatillos make slightly sweeter and milder salsas. Like eggplants and tomatoes, tomatillos like it hot and sunny! If you live in a region with winters, you can start tomatillos indoors under bright lights up to 8 weeks before your last frost date, but don’t transplant them out until the soil is good and warm - at least 50°F. Like some tomatoes, tomatillos are “indeterminate”, which means they will sprawl out all over the place if you don’t contain them in a cage (tomato cages work fine), and encourage them to grow up instead of out. Give them about 2 feet of space each if you use cages, or 3-4 feet if you let them sprawl. Plant the seeds about ¼” deep, either directly in the garden after the soil has warmed, or in seed flats. Being a bit of a wild and weedy plant, tomatillos are not heavy feeders, but do appreciate a bit of compost dug in at the time of planting. 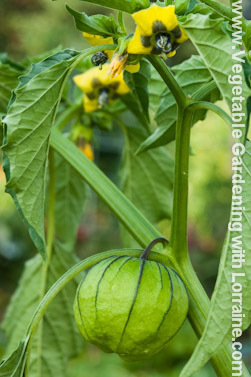 Tomatillos have very little trouble with pests. They may occasionally get hit with the fungal disease “early blight” if they stay too damp around the base. Don’t overwater them, and water them from below if possible (I’m not a fan of overhead watering). Using cages to keep them up off the ground also helps prevent blight. Why isn’t overhead watering the same as rain? Because a 90-degree-F, full-sun day shining on sopping wet leaves is not the same as a cooler, cloudier rain day. Tomatillos are often harvested unripe, since part of what they bring to the table is that special tartness. The bigger varieties like the traditional Mexican Green Husk, will burst the husk when they get 2" across and are ripe. The smaller varieties like the wild Purple de Milpe don't break the husk, and you should harvest them when they reach whatever size is described on the seed packet (in the purple's case, about 3/4"). They will keep at room temperature for about a week, or 2-3 if you keep them in the fridge. For the longest storage life, pull up the entire plant by the root when most fruits are ripening, shake off the dirt, and hang them upside down in a cool place, like an unheated basement or (non-freezing) garage. Or, for the really longest storage life, make salsa verde and can it!